On the bench is the frame of a cherry dulcimer and the cherry back with spruce braces it will soon receive. The kerfing on the sides gets notched to receive the ends of the braces and the ends of the braces are trimmed to fit in said notches. 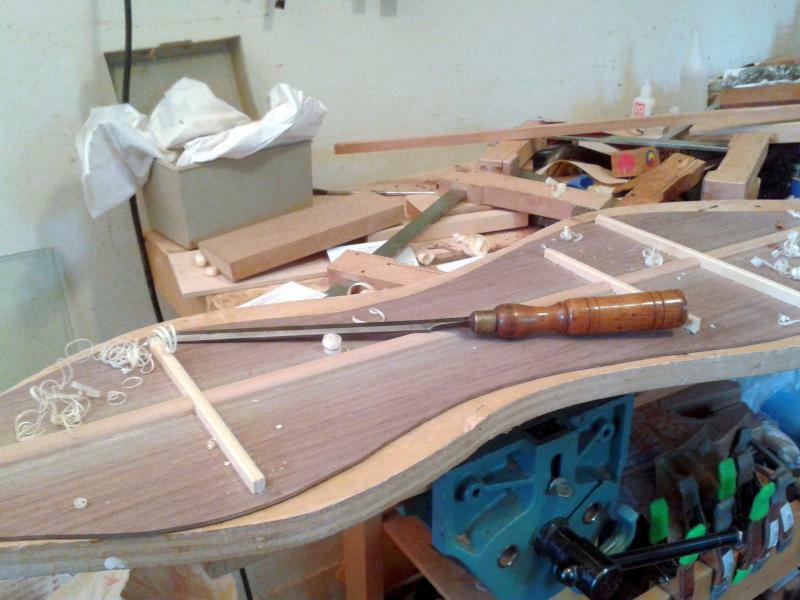 Attaching the ends of the braces into the sides adds strength and stability to the dulcimer. I took this photograph just before I began marking the brace locations on the sides with a pencil. Before gluing the back to the frame I’ll be adding small braces to reinforce the side sound port. I’m working on two other dulcimers that are several steps farther along. 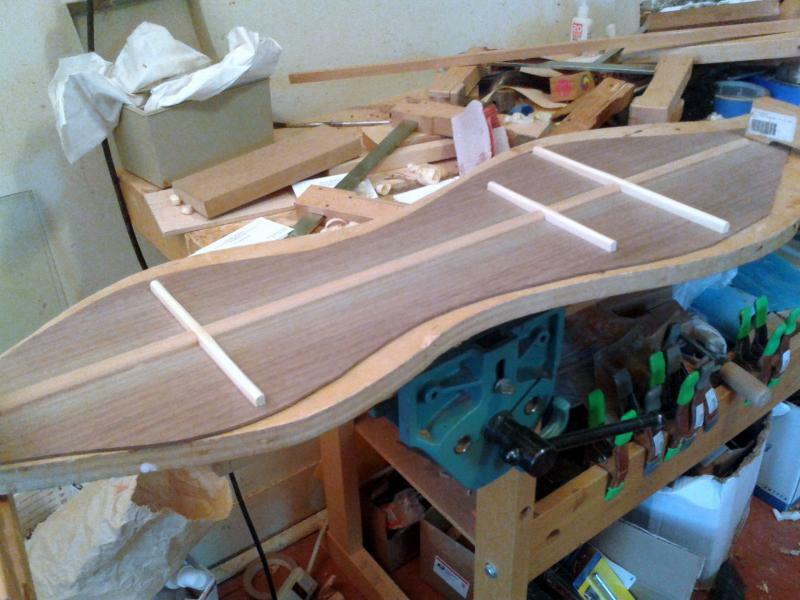 One dulcimer is in the homestretch, another will receive binding as soon as I bend it. I usually build dulcimers in groups of three or four but each dulcimer is given individual attention and worked on one at a time. This isn’t the most efficient means of production but I am happier with both the process and the results of working in this way. On the bench are the walnut sides and back of a dulcimer on the verge of becoming intimate. Before the magic happens I first have to notch the linings in the sides to receive the ends of the back braces. After that the I trim the braces to length and carve the ends to fit into the notches. I do most of this work with the small saw and chisel in the photograph. After making sure everything fits I’ll add glue and clamps and the two will become one. Nothing original here, just an old trick that makes quick, quiet work of squaring and evenly thicknessing wood. A few drops of super glue temporarily hold two wood runners to the bottom of a plane, in this case a Stanley #5 1/4 for those who care about such details. The plane can not take off wood below the height of the runners so repeatedly planing wood to the same height becomes easy. The top and bottom of the workpiece will also be parallel. In the photograph I’m planing spruce brace stock for dulcimer backs. The rough brace sits on my planing beam; a flat and straight beam of oak with a bench stop at one end. I use this planing beam when truing and jointing fretboards and fingerboards, thinning bindings, and brace stock. 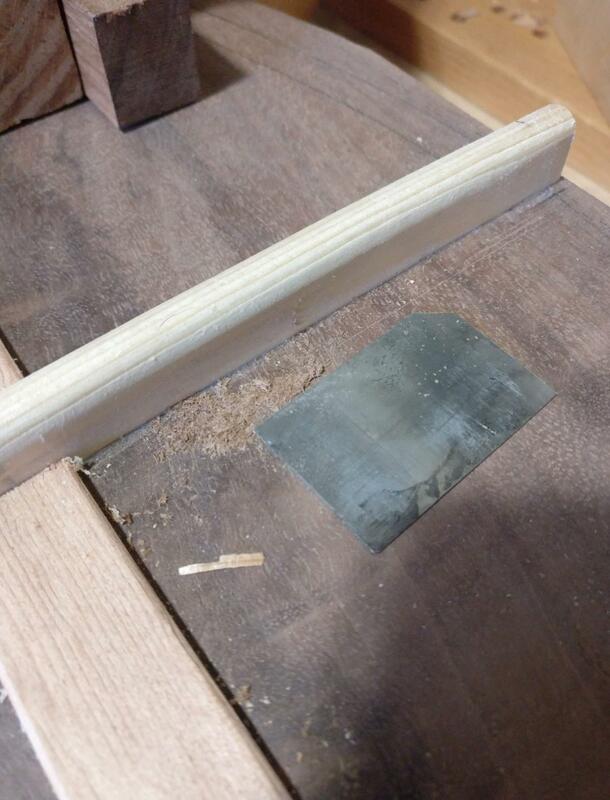 I also use the planing beam as a caul when gluing fingerboards to fretboards. Yes, it is a fascinating life I lead. I don’t have a standard pattern for dulcimer back braces. 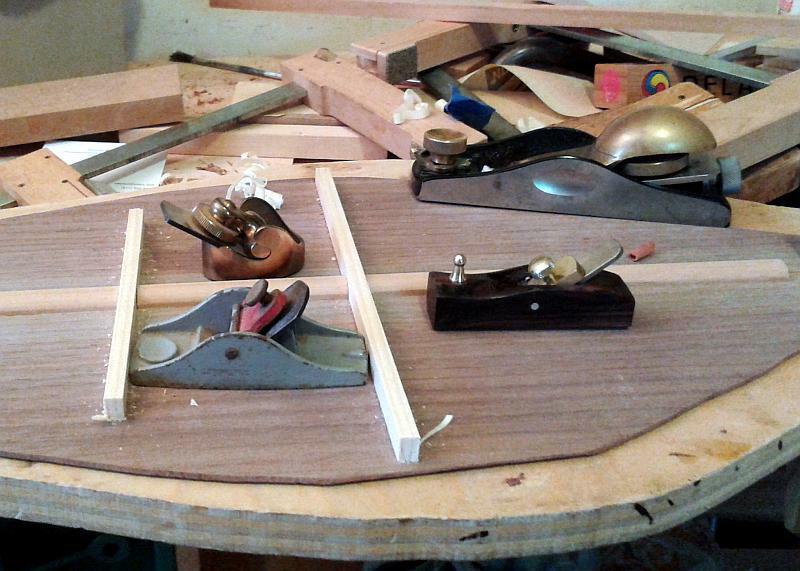 I don’t have a standard pattern for bracing dulcimer soundboards either. 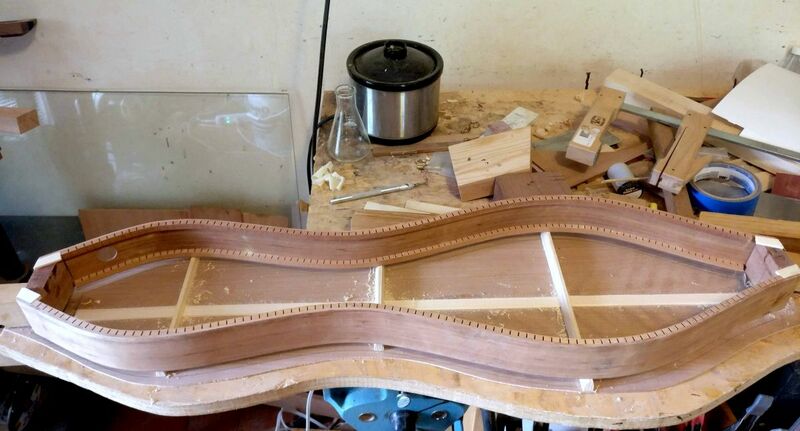 The bracing pattern, number of braces, and size of the braces depends on the sound I am after and the wood involved. It would be easier and faster to standardize things but that wouldn’t be any fun at all. I also find the results I get from taking the long route make a big difference in the sound of the dulcimer. In the photograph above you can see the four planes I use to dimension the back braces. The braces are brought to approximate size and then shaped after being glued to the back. This dulcimer back has three spruce cross braces and a Spanish Cedar reinforcement over the center joint. After getting the braces roughly to shape I do most of the final shaping with a paring chisel. In the photograph below you can see the paring chisel and the cute little shaving it makes. You can also see what a neat and highly organized workbench looks like. 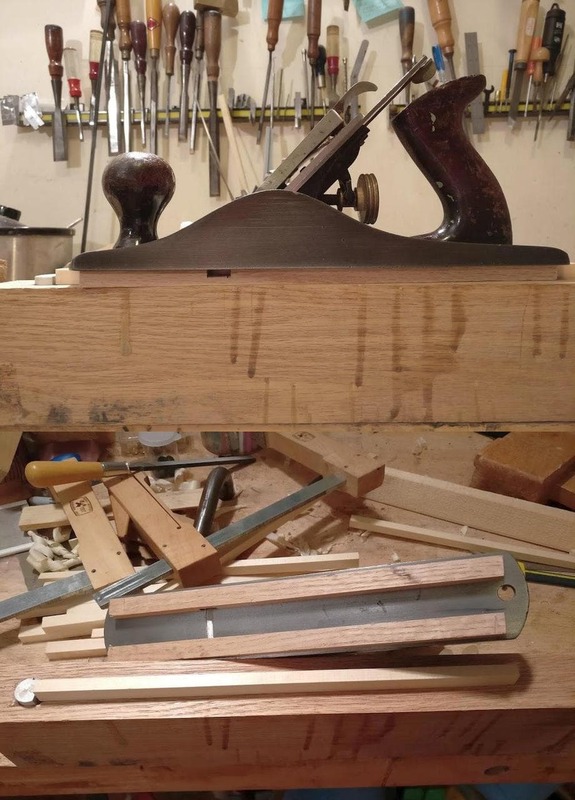 After using the paring chisel the shaping of the braces is complete, though sometimes I will sand the braces as in the completed back shown below; it just depends on what I feel like doing. Sometimes I prefer the crisp, clean lines left by edge tools, other times I go for the smooth and rounded look left by sanding. Next comes fitting the braces into the side linings and gluing the back to the sides.